The Proform FX5 elliptical trainer is part of Icon’s line of budget-priced fitness machines. In fact, the company sells about two dozen low-end models under $1000, and this model falls about in the middle. It has a 16" stride, which is the minimum we like to see on an elliptical, and it has a few other cool features like the push button digital resistance and the pace indicator. The elliptical trainer’s resistance varies automatically to whichever of the five Personal Trainer workouts you choose. You can also manually increase the resistance for a more intense workout. We also like the ProForm FX5’s Target Pacer, which is a little indicator light that tells you if you are falling behind in your workout and need to speed up, or slow down if you’ve started out too fast and need to pace yourself. 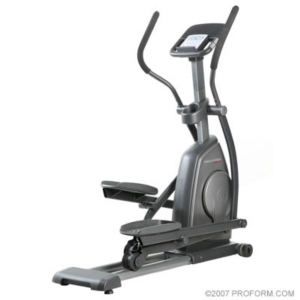 UPDATE: The ProForm FX5 Elliptical is no longer available. You can check out all of the current model reviews here. Fitness pros find too many drawbacks to this machine to recommend the ProForm FX5 elliptical trainer to potential buyers. The stride is too short, it’s noisy, it contains some cheap components, the overall quality and ergonomics are only so-so, and the one year warranty is weak. As for consumers who have used the Proform FX5, they are mixed on this one. As with other budget-priced Proform models, this can be a good machine for beginners who only use their machines four times a week for 30 or 40 minutes. But if you really want to strain and sweat during an elliptical workout, you are better off with a better quality elliptical trainer. The Proform FX5 has an MSRP of $899, but we’ve seen it advertised online for a sale price of $499. Still, on top of that, you’ve got to add in another $95 for shipping, so it will cost $600 to $1000 to buy this baby, and for that kind of money we are going to compare it head-to-head with the best-selling brands in the $500 to $1000 range. We would encourage you to look at some of the better choices out there, such as Schwinn and NordicTrack elliptical trainers. Final verdict: The Proform FX5 elliptical trainer is a decent starter machine but purchase it only if it’s on sale and ProForm throws in free shipping. Check the ProForm website for details.